A week or so back, the NCAA amended college football’s (and as well as the other sports’) recruiting policy to forbid coaches and recruiters from text messaging high school players. This may not seem like a particularly big deal. But for someone like me, an avid fan of college football, this development is meaningful, significant, and a reflection of how terrifying the machinery of collegiate athletics. Those that know me well know that I have a near psychotic obsession with Boston College sports. I’m a football season ticket holder, belong to two B.C. sports message boards and donate to my alma mater’s athletic fund with regularity. I’ve got a lot of pride in the school that educated me, and I cheer like a madman for my Eagles. I am, of course, no different than the millions of other red-blooded college sports fans that live and die by their teams. 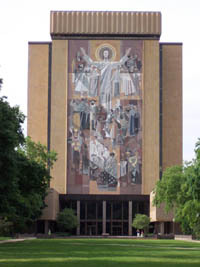 I know Notre Dame alums that travel to South Bend every year to give a nod to Touchdown Jesus and watch a game. I know folks from Harvard and Yale that describe their times in school as simply “we were 3-1 during my tenure.” I know families in Florida that fiercely argue over where you could get a better show: in The Swamp or at The U. Heck, I know that 92,000 people went to Alabama’s spring scrimmage. Their spring scrimmage. This kind of pride (and the rivalries that it spawns) create brotherhoods rooted in cultish devotion. And while I love being part of a community that exhibits such passion, I realize that this passion manifests itself in peculiar and often disturbing ways. Folks want success so bad that their love becomes a destructive force, driving coaches out of a job and tearing up the lives of the kids that play. Allow me to explain how it all works. A school wants happy alums that donate generously and encourage their sons and daughters to matriculate there when they are of age. One of the best ways to turn alums into happy alums is to field teams of young men and women to do battle for the honor of their beloved school. Through sport, the great and powerful conversation starter, do schools stoke the fire that keeps an endowment nice and warm. Sports is marketing, and marketing is easiest when a good product is being sold. So what is a good product? A winning team and success in the carefully crafted rivalries. And how is a good product made? With premium ingredients and a celebrity chef. That is unfortunate for three reasons. Premium ingredients are very hard to come by, a couple hundred chefs are fighting over them, and they just so happen to be seventeen year old kids. All of the fanatics, from the million dollar doner to the million one-dollar doners, want their schools to win every recruiting battle. For eight months out of the year, it’s the only game in town. That pressure to succeed on the recruiting front manifests itself during alumni association-funded “Breakfasts with the Coaches” and during radio call-ins to local stations. Generous and concerned boosters start putting the heat on the athletic directors, who in turn start putting heat on the coaches, who in turn start putting heat on their recruiters. Such is the nature of this beast. The futures of high school athletes are tossed around like trading cards, with results that range from horrendous to downright funny. College football, and college football recruiting, has evolved into this. The media coverage, the love of your alma mater and the big business of Sport are thrown together to creating the frenzy that we know today. The NCAA, trying to bring some order to the chaos, regulates how contact can and should be made with high school athletes. But they’re building a fence to stop a tidal wave. The brutal nature it pours through the gaps. There’s no more text messaging. But the daily mailings, the furtive work of boosters and the dubious morality is going to continue. It’s not going to stop me from being a fan. But I hope it gives us all pause before we start bashing our favorite college program for not landing the big one.